Here is our newest herd member, Sweet Pea, born on Mother’s day. Peaches never ceases to amaze us. Another stunner! With Peaches getting up in age, I expect we will keep this little one as a possible replacement. 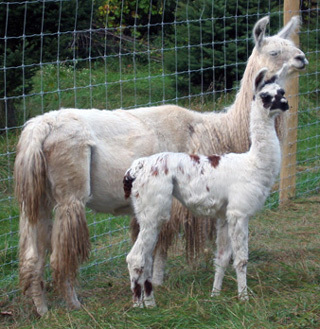 She has the conformation of her granddam, Mancha & the fiber of her ½ argentine sire, Rory. Sweet definitely describes her personality. Welcome to the Gemini family, Sweet Pea! A miracle birth by Hermoine, who had a serious bout of meningeal worm in February. 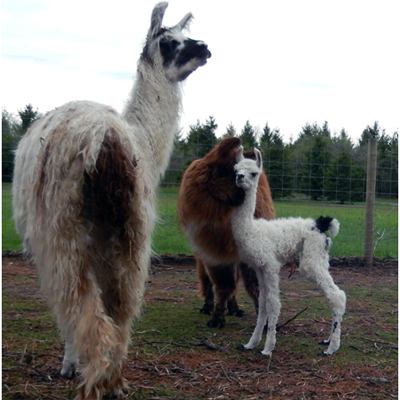 We successfully saved her & thus-her beautiful female cria as well. Approx. 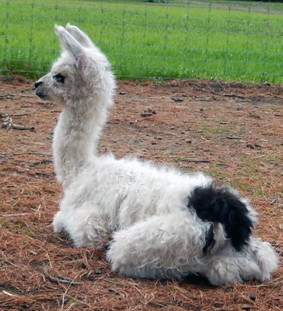 20# at birth, this cria is compact, energetic and full of vim & vigor. 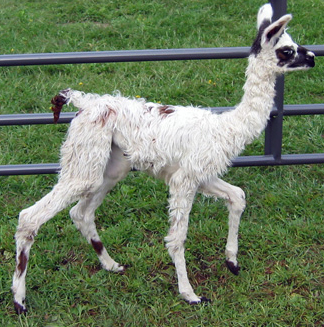 Hermoine, though she will always have a limp, was able to deliver her easily and has loads of milk. Bambini's is excellent:beautiful ears, legs and a nice straight back, as this picture shows. She will likely be in the county 4-H program next summer. Here is a beautiful female out of Danica with suri fiber just like her father Phoenix. 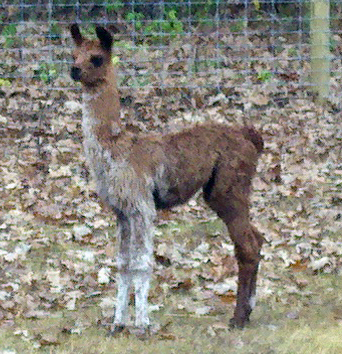 Born with a few spots of color and excellent conformation. We hope to show this girl in 2013.